The scene Monday along Interstate 5 in Washington was stunning: train cars dangling over the freeway, vehicles underneath crushed to bits, survivors who were given a commemorative lanyard for the ride left screaming and having to kick out windows to escape. A train along Amtrak’s Cascades route, somewhere between the cities of Lakewood and Olympia and hours into its inaugural ride, abruptly ended in what appears to be one of the worst wrecks for Amtrak in years. By the afternoon, the casualty toll stood at six dead, more than 75 hospitalized. Authorities began the long process Monday of trying to piece together what caused nearly all of the Cascades Train 501 cars—carrying 78 passengers and seven crew members—to jump the track and onto I-5. The National Transportation Safety Board also sent out a team of investigators, but results of the agency’s findings won’t be known for months. The reason why trains derail has become a common question in recent years, as the number of very violent crashes has seemingly continued apace, following the deadly 2015 Amtrak crash in Philadelphia that killed eight and left dozens wounded. Amtrak in particular has seen an uptick in derailments. An official briefed on the investigation into what happened in Washington told the Associated Press it’s initially believed the train may’ve struck something before derailing, but rail experts who spoke to Jalopnik on Monday said that authorities will likely be looking at speed as a factor. “It’s becoming more and more apparent that speed was an issue here,” said William Keppen, a rail expert who worked as an engineer of the freight line Burlington Northern for 13 years. Once overhead images of the crash emerged, that seemed to become more obvious, he said. The train was designed to carry speeds of 79 mph, but was clocked at 81.1 mph moments before the crash, according to transitdocs.com, which can track Amtrak train locations and speeds using the company’s train tracker app. Steven Ditmeyer, a former official at the Federal Railroad Administration, told Jalopnik that speed “might” have played a role. The roughly 80 mph it was traveling at is standard for the Amtrak train. “What I don’t know is what the speed limit that the railroad had imposed on the track [at the curve],” he said. Ditmeyer noted that Amtrak has conducted extensive testing on the route throughout the year, so it’s unlikely that any procedural issues lead to the crash. That leaves a few possibilities, he said. Amtrak has a technology called Positive Train Control, which is designed to automatically maintain a train’s speed based on the conditions. By law, the technology is supposed to be installed on all passenger trains by 2018, but that deadline has been pushed back by rail agencies who’ve said it’s become complicated to implement, reports Reuters. Amtrak’s co-chief executive, Richard Anderson, wouldn’t speculate to reporters about what the cause of Monday’s crash may’ve been, but he did confirm that Positive Train Control wasn’t installed on the newly rebuilt passenger tracks where the latest crash occurred. The tracks are part of a $181 million project to improve service between Portland and Seattle. As one railroad investigator put it, that’d be a tragedy in and of itself. John Hiatt, a railroad investigator, told CNN that the technology is like an “angel on our shoulders” for train engineers. “If there was no Positive Train Control in effect there, then shame on them,” he said. One factor in previous crashes has been the country’s lack of resources for rail transportation, leaving Amtrak in a position where it’s constantly fighting legislators who’d prefer to strip it of funding. So, while it posts record ridership numbers, Amtrak’s budget. is constantly getting routed by Republicans who’d prefer to see its government subsidies diminished. Years back, mechanical problems led to what’s considered the first major accident of the Amtrak system, according to the Washington Post, which cites a book by University of North Dakota mechanical engineering professor George Bibel in its own exploration in 2015 of what causes Amtrak derailments. Poor train handling, incorrectly set track switches, unsecured cars on a hill, shifted loads, vandalism, or obstructions on the track are among the human causes of derailments. Derailments can also be caused by flash floods, avalanches, rock slides, and high winds. With Monday’s crash, it’s likely that infrastructure wasn’t a key role. The rail line was new, after all. It’s almost certain the crew knew what to expect with their routes, so it’s unlikely crew fatigue played a role—though Keppen cited it as being an unquestionable source of other crashes. “I’ve been dealing with the industry on human factor issues for years and they’ve been, I would say, relatively intransigent in dealing with it,” he said. 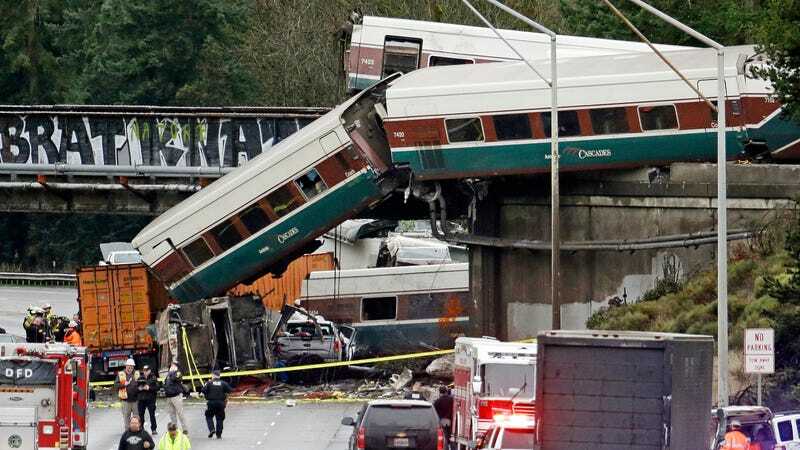 In Washington, with the casualty count as high as it already is, questions are going to loom for months over what Amtrak could’ve done ahead of time and what happened with the engineers moments before the crash. Late Monday, officials near the scene still couldn’t disclose a death toll.